There may be no cigar lounge in the world more impressive to behold and more difficult to describe than the Arturo Fuente Cigar Club. Co-owned by Carlos Fuente Jr. and Ciro Cascella, the place is a hub for the capital city’s elite power brokers. Upon entering, you walk into what looks like the lobby of a swanky boutique resort. Despite the “club” name and posh appearance, it’s open to the public. Just be sure to dress accordingly. Beautiful greeters welcome all guests and get them situated. Situated? Yes, there are several accommodation options to consider even before you get to the cigars, food and drinks. You can have a business meeting in one of the private Executive Rooms; each is exquisitely decorated and designed with a different purpose, several of them running alongside the lounge giving patrons the privacy they require while still being part of the action. No expense was spared when the club was renovated and the open checkbook is probably most apparent in the Executive Rooms. To give you an idea, a couple of the rooms feature crown molding made of actual Opus X and Añejo cigars. “Those are actual Opus X and Añejo cigars,” exclaimed Cascella as we walked into the room. “We did not replace them with standins, we don’t do things halfway here.” It’s hard to imagine that a cigar club could offer such a sophisticated gourmet dining experience, but if you enjoy seafood you would be hard-pressed to find a better fine dining option anywhere. Anywhere. The shrimp three ways dish is, simply put, one of the better shrimp dishes you can have and the sea bass carpaccio is a unique expression of Peruvian fusion. The wine cellar is superb and the full liquor bar features one of the best selections of Scotch on the island. Now for the cigars. Outside of Casa Fuente in Las Vegas, you are not likely to find a more complete selection of the entire product offering from Arturo Fuente. From the hardest-to-find Opus and Añejos to the more ubiquitous Fuente 8-5-8, they are all showcased in a museum-like setting. But don’t fear the museum; you can touch and smoke the art here! Luxury watchmakers Hublot have announced the creation of the King Power “Arturo Fuente”, a watch made in tribute to the Opus X, a cigar which connoisseurs have dubbed the rarest in the world. The Opus X is no ordinary cigar, so you can be certain the King Power “Arturo Fuente” timepiece is just as extraordinary. This limited edition timepiece will be delivered in a genuine cigar case of Macassar ebony and carbon which bears the Opus X and Hublot logos. Inside the case is a special edition of Arturo Fuente’s Opus X cigar. Arturo Fuente Sr. founded his eponymous company in 1912 in West Tampa, Florida. Today the brand is world-famous for their premium, hand-rolled cigars. Only 100 pieces of the Gold version of the King Power “Arturo Fuente” will be produced, while the Ceramic version is limited to 200 pieces. Check out our exclusive gallery to see more views of this timepiece, as well as the limited-edition cigar case. Thirty-two-year-old Liana Fuente had been sneaking puffs of cigars for as long as she could remember. 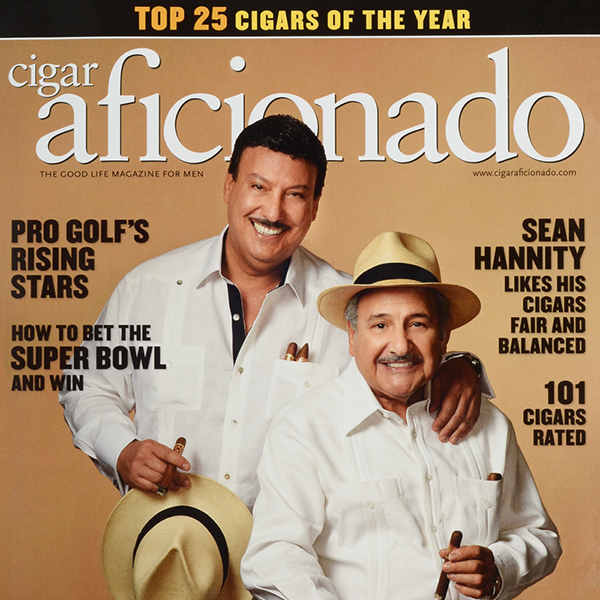 Being born into the world famous Fuente Cigar family meant that cigars were never hard to come by. Liana’s childhood memories of her grandfather, Carlos Fuente, and father, Carlito, always seemed to included a dangling cigar from their mouths. Sometimes, when they were not looking, she said she would sneak into one of their offices, steal a puff or two, as most children would do as an act of curiosity. But it wasn’t until she was older did she have the opportunity to smoke one from start to finish. At a young age, Liana Fuente was in New Orleans with her father for the first time attending major cigar convention. While on their way out to dinner, her father and a group of his friends lit up cigars. She prodded her father for one so she could join in on the festivities. He agreed to provide her with a cigar, an Opus X Lancero. This is one of Fuente’s most sought out cigar and one of the most beloved in the entire industry, but it was a lot larger and stronger than she desired for her first cigar. Excepting her father’s prideful selection, she grabbed it and puffed away. Nicknamed “The First Lady of Cigars” for holding the highest ranking corporate position within the cigar industry—president of US. operations for Arturo Fuente Tobacco Company~Cynthia Fuente Suarez is constantly asked what it is like to be a woman in a “man’s world” and how it feels to be a female pioneer in the tobacco industry. For Fuente, these are confounding questions. 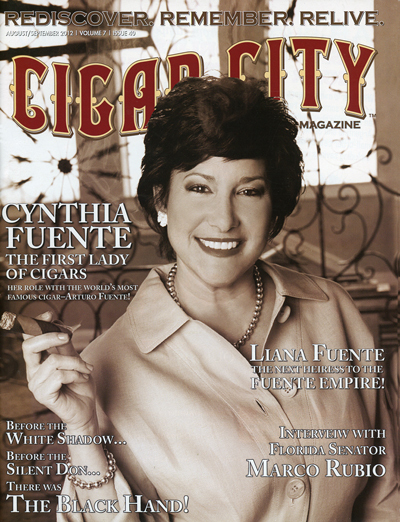 A woman in the cigar industry is special? She is a pioneer? Fuente has been part of the cigar industry since the day she was born and for as far back as she can remember, women have not just been a part of it—they have been a major part of it. The warehouses were completely engulfed in flames, and the firefighters were losing the battle. The men and women attacked the fire, spurting water through the windows of the blazing buildings until the smoke and the heat overwhelmed them. Even when they could fight no longer they called for milk in hopes of fortifying themselves for another round, But it was too late. Two large warehouses with irreplaceable stocks of tobacco were lost. Veritable bunkers, the two structures had seemed impregnable until Hurricane lrene raged to within 70 miles of Villa Gonzalez, Dominican Republic, stirring Winds that fed the flames. Even as the blaze leapt toward the sky, rains lashed the scene, almost in irony. Inside was a treasure trove, tobacco that was years and even decades old, leaves from around the world that had been destined to he rolled into celebratory smokes for its owner, Tabacalera A. Fuente y Cia. Casa Cuba, Double Cinco in pre release slide lid box are the best! Unfortunately there are too few remaining…..Don Carlos #3 and #4 as well as production Robustos, I’ve smoked many hundreds of each…..I’d love to try an Opus X filler binder with Cameroon DC Lancero wrapper!!! No matter how long it’s been since I have smoked one, whenever I pick up a Fuente I have enjoyed it’s like the first time all over again.